What did the Mission say? As I approached the youth surveyor’s booth at MCM last Thursday, all six surveyors were engaged in conversation with a passer-by. They looked relaxed and in charge, fielding questions about where to use the bathroom even as they explained the results of their survey to curious market goers. 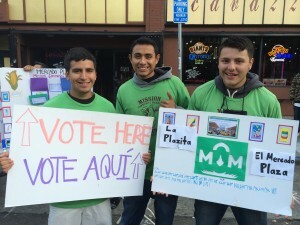 Daniel Cortes, Daniel Mendoza, and Giovanni Carreño ask market goers to vote for the permanent name of the plaza. 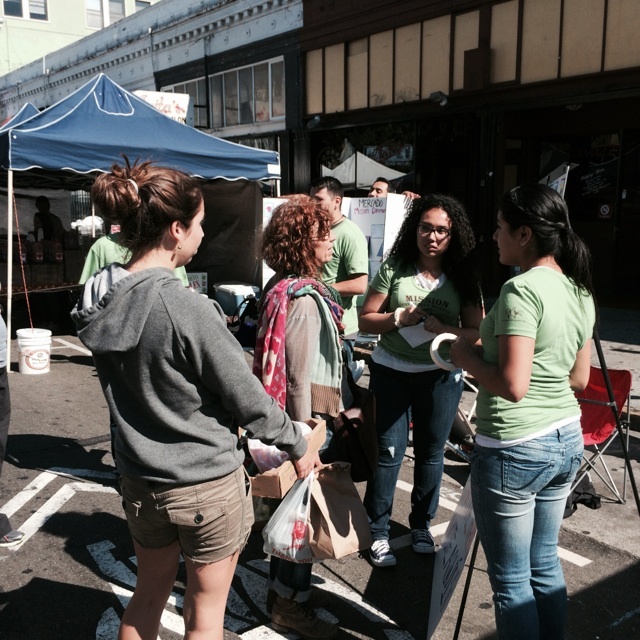 It’s no surprise that the surveyors are comfortable––they live locally, are fluent in Spanish, and spent the last month distributing surveys at the market and throughout the Mission District. The 30-minute surveys addressed community opinions about the Bartlett plaza project, which the City plans to finish constructing in the spring of 2015. 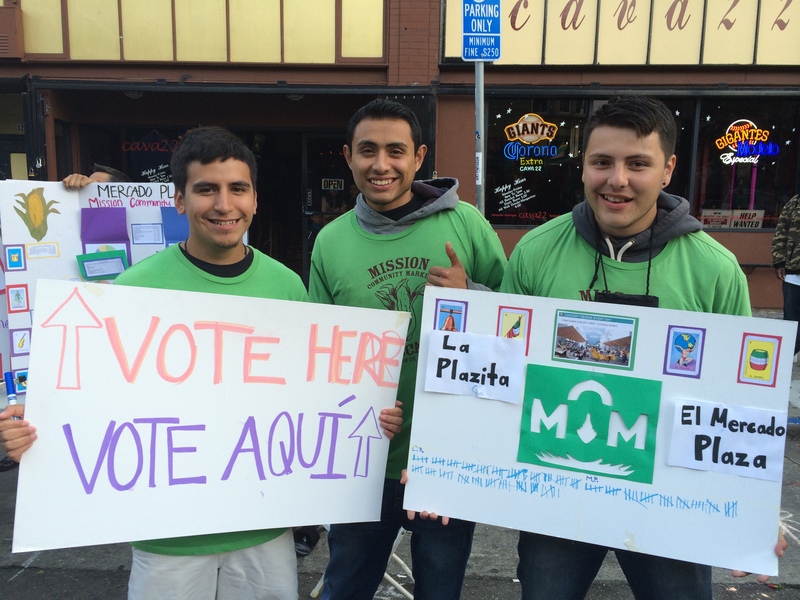 To prepare, the surveyors asked Mission locals about what kind of programming, art, and facilities they’d like to see at the plaza. 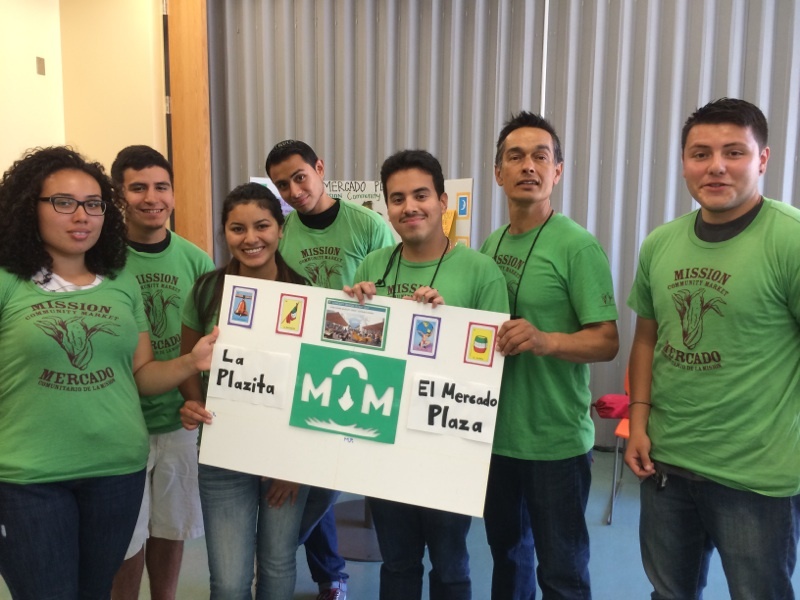 Many people, said Rojas, “thought the plaza would create a lot more connections within the community. They were excited for more programming, especially for kids.” Others were interested in health related programs, Rojas said. 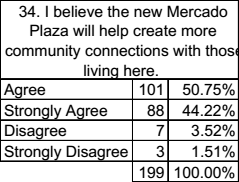 About 95% of those surveyed either agreed or strongly agreed that the new plaza will aid community connections. 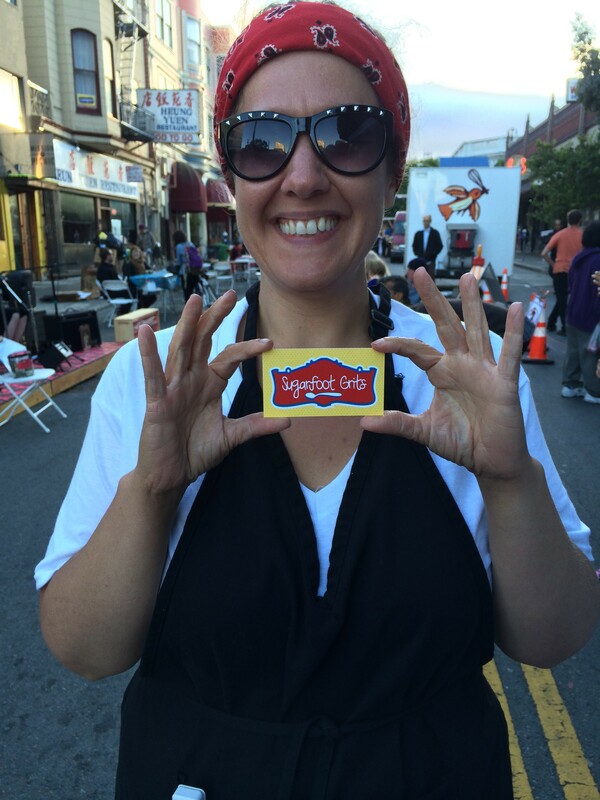 In the Mission District, diversity is a touchy subject. 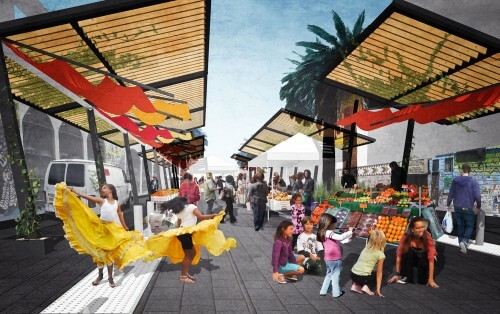 The planned plaza, which is slated for construction on Bartlett Street, straddles two different populations within the Mission––the historic, Latin@ population, and the newer population of young adults and Caucasian families. Along with a majority Latin@ response, 46.46% of those surveyed had lived in the Mission for more than 10 years. Susy Rojas and Nathaly De Leon answer questions at Mission Community Market. Rojas noted that the surveys also helped her connect with Mission Community Market. 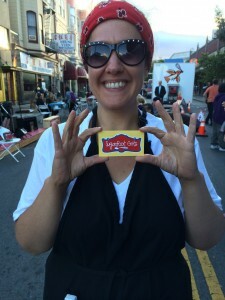 “You get to see a lot of different characters at the market,” said Rojas. The surveyors will be available to answer any questions about the plaza and their survey data this Sunday, August 24th, at their booth on Valencia St. between 21st-22nd Streets during Sunday Streets. 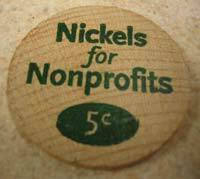 Thanks to Whole Foods Market, when you shop at the Potrero or Market-Castro stores, bring in your own bags for groceries and you’ll have the option of receiving a 5¢ credit (per bag) or to donate the 5¢ to MCM. Our organization was selected for July and August and at the end of this time, MCM will receive the monies that have been donated. Please shop at these Whole Food locations from now until Aug. 31 and support your Mission Mercado! 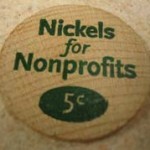 Tell your friends, and thanks to Whole Foods Market! If you haven’t picked up cucumbers from Blue House Farms yet, now is the time. 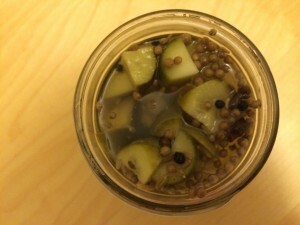 Quick pickling the cucumbers is simple and results in sweet, tangy pickles that are perfect on kabobs, in burgers, or thrown on salads. They’re easy to store and look great in jars––give them as a gift for your next breezy summer picnic or dinner party! This recipe adapted from Canning & Preserving by Ashley English. 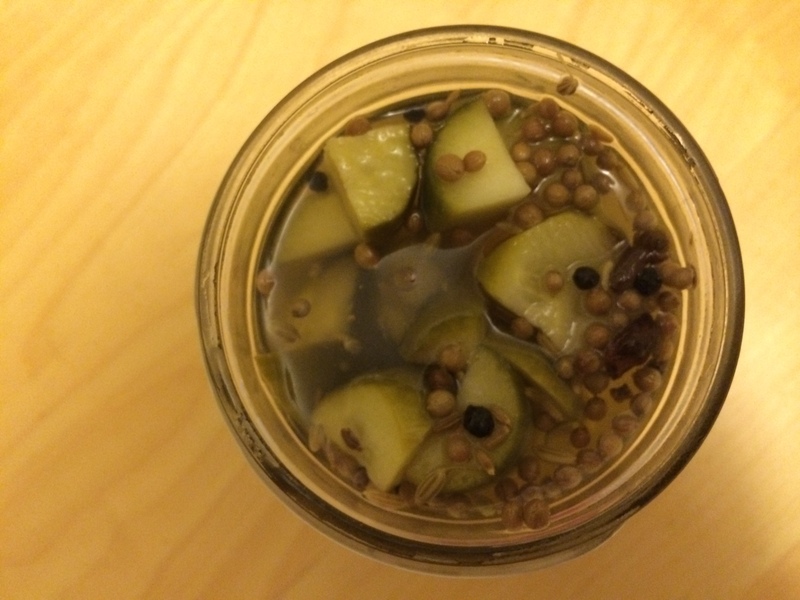 Sanitize the containers that you will use to store your pickles. A glass mason jar works great, but any glass or ceramic dcontainer will work. Then, wash and scrub your cucumbers. Cut about 1/4 inch from each end, then cut each cucumber in half and place in a bowl. Combine 2 1/2 cups water with vinegar, sugar, salt, garlic, and spices in a medium saucepan over medium-high heat. English’s original recipe excludes apple cider vinegar and star anise, but adding those ingredients will increase the sweetness of your pickles. Bring the mixture to a boil, then reduce heat and simmer. After five minutes, remove from heat. After the mixture has cooled for fifteen minutes, pour over the cucumbers. Cover the bowl with a cloth, and allow to cool for an hour. Transfer to container and refrigerate.